I trust you already have an understanding about the concept of blockchain and how it works? If you haven't, read about blockchain and cryptocurrency here. Essentially with a blockchain, exact copies of transaction records (ledger / database) are distributed across the network. The ledger is transparent for anyone to view, so you can actually verify the progress and get confirmation of your transactions yourself. An address: To find out more details about the address, for example the balance, and transactions that has been done by that address. A transaction hash (transaction ID): To verify whether a transaction has been completed, and to check how many blocks has confirmed it - since blockchain is a string of blocks that contain all previous transactions. Transaction ID: Parameter after the "/tx/". Which block number this transaction occurred on. How many blocks have confirmed the transaction. Timestamp: When the transaction happened (date, time, and timezone). Address of the sender: In this case 0xf1f5a00f88542b835df57298d496e9798c09f671. Address of the recipient: In this case 0x4d0280da2f2fda5103914bcc5aad114743152a9c. Value: How much was sent. It is also common to show the value as 0 here, when the transaction occurs for an Ethereum-based token (for example, an OmiseGo (OMG) transaction, or a Basic Attention Token (BAT) transaction, in which case it will provide the informatio in the "To" section. 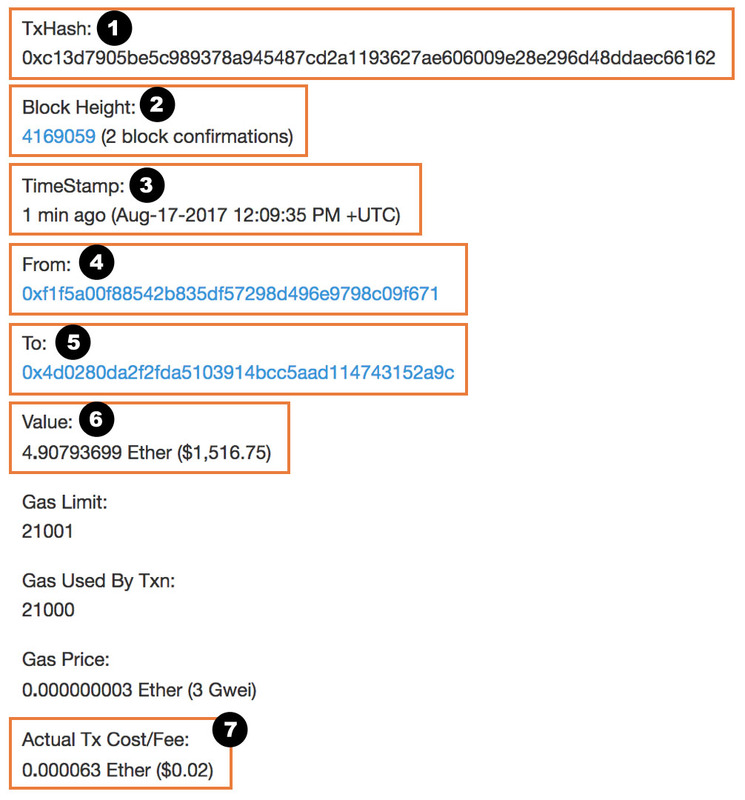 Transaction Fee (paid to the miners): The actual transaction fee (in the form of Ether and US$) to pay for the transaction. Its Ether or token balances (if it has any). How many transactions have been done previously. The value of each transaction. The sender or the recipient of each transaction.